Ballpark Digest is previewing what every MLB team is doing to begin the season, both on and off the field, as the 2019 season is underway. Up next: the Los Angeles Angels and Angel Stadium. The concessions at Angel Stadium will feature some new flavors this season, as the Angels have rolled out some distinct options with concessionaire Legends. Beginning this season, Angel Stadium will feature two Bamboo Bowl stands located at Sections 240 and 424. At those locations, fans will be able to find items such as Chicken Teriyaki Bowl, Beef Bowl, and the Chinese Chicken Salad. Also new for this season is the Big A Burger, featuring cheeseburger patties with secret sauce served on a potato bun. The burger–which derives its name from Angel Stadium’s nickname and the former scoreboard that now sits in the ballpark’s parking lot–will be served at a stand at Section 107, where fans will also find Shakes and Light it Up Fries. For a mix of beer and new food options, fans can head to the Saint Archer Brewing Co. Restaurant at Section 348. Headlining the menu there is a slate that includes Kung Pao Drumsticks and Thai Sticky Ribs, with an Ice Cream Sandwich Trio providing a dessert option. Saint Archer Brewing Co. will also have its beers on tap. An area of Angel Stadium that features a constantly evolving menu is the Change Up Kitchen. Located near Section 226, the space features a menu that is updated every month with new player-inspired food items. In April, the Change Up Kitchen will feature a lineup that includes beef tacos and fried tamales. Fans on the Club Level can seek out the dessert cart for some new sweet treats. Among the items the cart will offer this season include Red Velvet Whoopie Pies, along with a Jumbo Rice Krispy, a Jumbo Cake Brownie, and more. 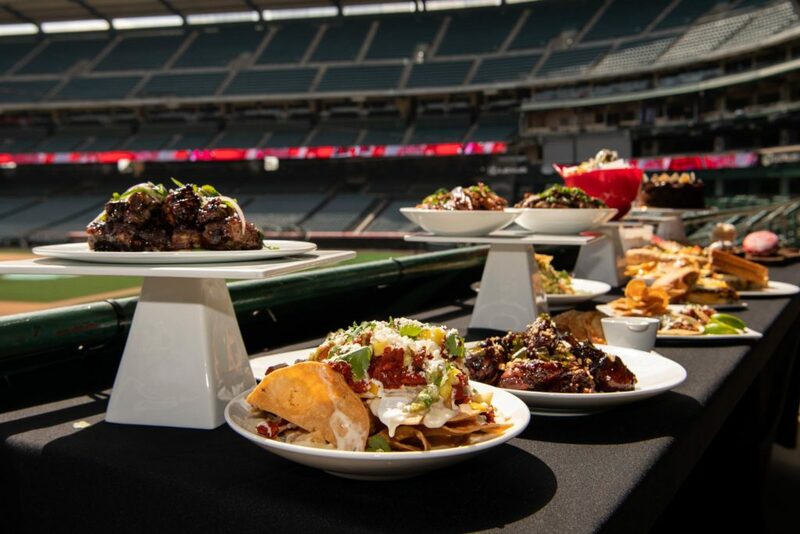 New food items highlight the additions to Angel Stadium for 2019, but look for the Angels to potentially make some big decisions about their future over the course of the season. After opting out of their Angel Stadium lease last fall–and later renewing for 2020–the Angels opened the door for discussions of a new or renovated ballpark. Anaheim officials and the Angels are undertaking their own due diligence processes now, which could lead to the two sides negotiating a long-term facility solution that includes a renovation or a new ballpark in the Angel Stadium parking lot with surrounding development. However, Long Beach officials have also been making overtures about landing the team, pitching a waterfront lot as a potential site. Where these discussions lead remains to be seen, but it stands reason that the Angels will make some type of progress on a long-term facility plan over the course of 2019. Image courtesy Los Angeles Angels.